Thank you for the tremendous response to the Quizzr - our free quizzing platform for everyone. 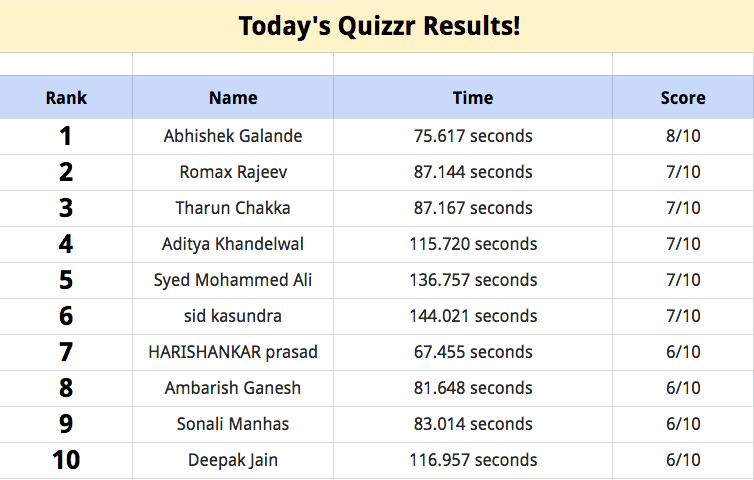 Following is the list of top scorers of Quizzr's Quiz that took place on August 13 at 9:00 PM (IST). IMHO, the questions were easy! The overall turnout for this quiz wasn't great. It looks like the quizzes in the morning had a lot more audience than the ones that happen in the evening. I was desperate to participate but forgot in daily routine. Next time I'll make sure to set an alarm before the quiz starts. We're sorry to hear that you missed the Quiz. We had sent multiple reminders for both of the quizzes. Next one is coming up on Saturday.. 18th August at 9:00 PM (IST). Do keep check on emails for the announcements and reminders.